Just like whales, they are marine mammals. They belong to the order of odontoceti (that is, cetacea with teeth). 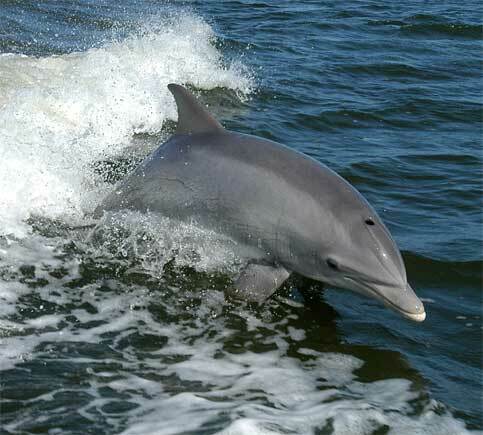 Several species are categorised as dolphins and they can be found in the sea, as well as in certain rivers. Their morphology is dictated by the aquatic environment in which they live and to which they are perfectly adapted. Let's go through this together: its jaw is called a rostrum and generally has numerous teeth (Except, for example, Risso's dolphin, which only has a few teeth in its lower jaw). This ‘mouth' serves well in trapping prey, but also in protecting itself in clashes with its adversaries. As with whales, evolution misplaced the dolphin's ‘nose' on its head, which closes when it dives and opens when it is on the surface, so that it can breathe. It does not have visible ears (a tiny opening of 2 to 3 millimetres at the back of its eyes serves as a replacement), in fact, the whole of its skull, including its lower jaw, will help it capture sounds that are transmitted to its internal ear for processing by the brain. One could say that the dolphin ‘sees' sounds, since Nature equipped it with an extraordinary system which helps it observe its environment without using its sense of sight. This system consists of the receiver described above, as well as a transmitter which will help it produce sounds that will bounce off obstacles before coming back. This faculty is called echolocation; it offers dolphins a sound image of its surroundings. When a dolphin wants to have an overall image of something, it issues low-frequency signals that are propagated over several hundreds of metres, but are not very precise. To see a detailed image, it uses high-frequency signals with a reduced range which provide an impressive amount of information, ranging from the shape of the objects and/or creatures that are in its environment, to their texture and it can scan living beings, since its natural scanner sees through the skin! This explains how blind fresh water dolphins exist (for example, those from the Indus). Living in muddy rivers, they have lost the use of their eyes, but they compensate for this with their sonar system. Their eyes are very efficient (with the exception of blind dolphins, which we have mentioned above). Their lenses are in fact capable of changing shape, according to whether they are under or on top of the water, thus offering them excellent sight in all circumstances. Why do they have this morphology? The dolphin has 2 pectoral fins, which, together with its dorsal and caudal fins (tail), form its propulsive and directive system. It's underwater movement capacity is remarkable, it must be said here that evolution created a masterpiece which enables it to travel at more than 45 km/hr (in comparison, the fastest human swimmer can not even exceed 10 km/hr!). Everything about the dolphin is optimised for performance in the water: its skin, with a structure modified in terms of speed, which in certain circumstances even produces oil; the hydrodynamic form of its body; the position and shape of its fins; the absence of any roughness which could slow it down. When it attains its maximum speed, it regularly leaps outside the water, because the air resistance is weaker and it can accelerate even further.